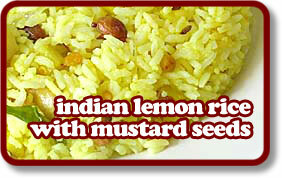 A delicious and different way to prepare Indian rice. This is a fresh and tasty recipe packed with flavour. It’s easy to prepare and is especially good if you have any leftover rice from another curry fest. For guaranteed results, I have found that cooking rice as you would (should) cook pasta gives excellent results. Fill a large pan with hot water and bring to a rolling boil. Add the rice and then cook until tender but not too soft. Drain into a large seive and leave to cool completely, shaking occasionally. Now, in a large frying pan or wok, heat the oil over a medium high heat. Add the mustard seeds and cover the pan. After about 30 seconds when all is silent add the peanuts and stir fry for 1-2 minutes until golden brown. Now reduce the heat and quickly add the ginger, sugar, garlic, turmeric, cayenne pepper, curry leaves, chillies, salt, rice and lemon juice. Add a couple of tablespoons of water and stir well. Stir for about 5 minutes to ensure all the flavours are blended before serving. Great with delicate currys, especially my delicious Sri Lankan Fish Curry. Also works incredibly well cold as a salad type thing.